Can Sewing Save You Money??? 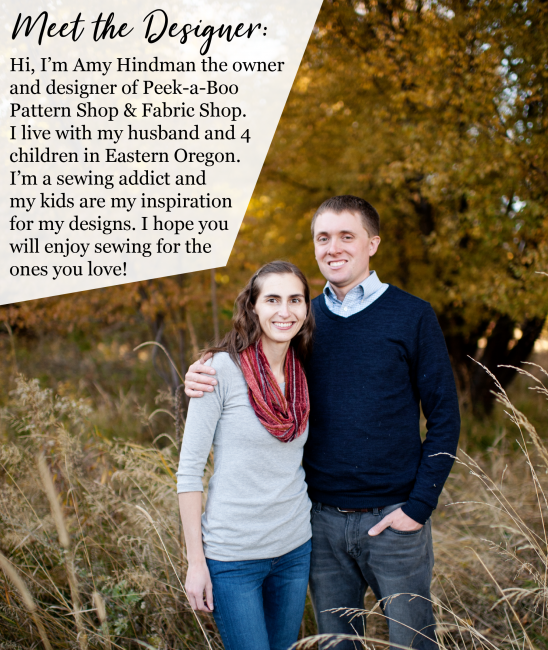 I hear this question all the time… “Can sewing save you money? ” The answer is Yes! Read below to find out how sewing can save you money! Since I hear it so often, I did a little research. It’s generally well accepted that if you want a boutique dress from a specialty shop that you can save money sewing it yourself but what about the everyday items? 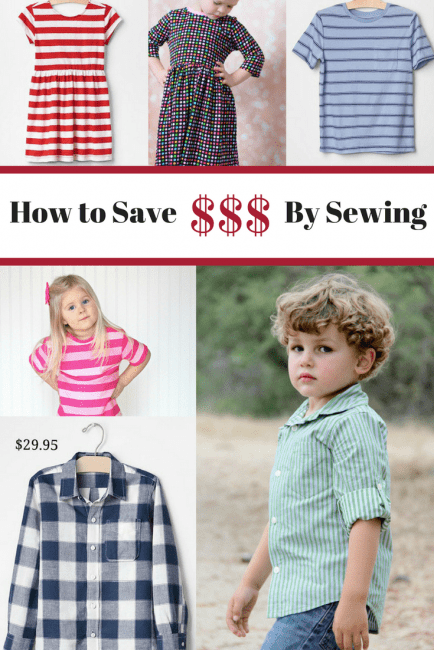 Sewing can definitely save you money! I compiled a list of basic clothing items and found a similar item at Gap and Target. If you normally shop somewhere more or less expensive you’ll have to keep that in mind when looking at the chart but this gives a good benchmark. All pricing is based on a child’s size 5. I did not factor in pattern price. If you already own a pattern that will work for you, then your cost is $0! If you need to purchase one I recommend dividing the pattern price by the number of times you know you will use it. For example, if the pattern is $8 and your child is still at the low end of the size range and it’s an everyday item, it’s reasonable to assume you will use it at least 8 times making your pattern cost $1. If it’s for a special occasion and you might only use it twice your pattern cost is $4. For knit items I used a “Designer” price of $18/yard (Art Gallery, Riley Blake, Birch, custom knits, etc.) and a “Bargain” price of $7/yard. If the yardage required for an item is 1/2 yard but you’ll have enough width on the bolt to make 2 items I divided the cost by 2. Use those scraps! For items with buttons or zippers I did include that in the cost. I didn’t factor in thread, scissors and other basic supplies you should have on hand. Price doesn’t always equal quality. A Target dress might hold up just as well as one from Gap and your $7 knit might be just as good as an $18 knit. Typically it’s a good indicator but not always. Hopefully by having both prices to look at will help you determine the comparative cost depending on your particular fabric and the item in question. What are you waiting for? 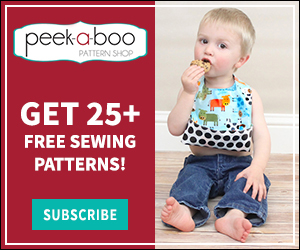 Can Sewing Save You Money! I typically buy my fabric in bulk when it it’s on sale or clearance, and save even more. I almost never buy fabric for a particular item. That saved even more money in the long run. LOVE this! Of course 🙂 My whole blog is dedicated to this topic, how could I not love this!? I love the comparison to store-bought clothes too. Thanks for compiling this and sharing that sewing can save you money. Plus, what’s more important, sewing your own clothes helps to limit people working in sweat shops to sell cheap clothes. When we make our own clothes we know what goes into it and exactly how it’s made! 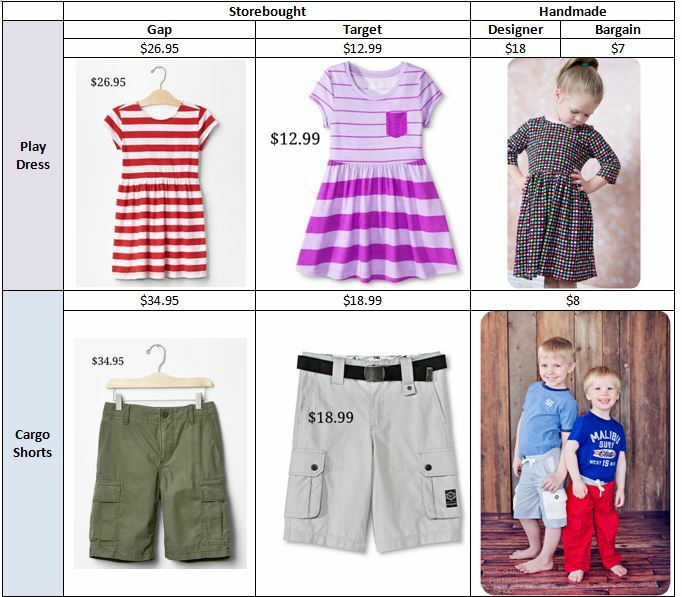 BEing a SAHM, no income at all, I found in my skill a great way to save us some money by making our kids clothes. It really helps me save and sometimes I can make items at cost 0$ because I refashion/upcycle all the time. This is something my husband and I have talked about. We decided even if it costs a little extra (we live hundreds of miles from fabric stores) to make it, it’s worth it to have something unique! Great article!!! Thanks for putting this together. This is really interesting! I think I will start keeping track of the costs of items, just to see. Great post!! This is one of the reasons I make the majority of my own clothes. I do have problems finding quality fabric for a reasonable price though. ABSOLUTELY AMY!!! I created an almost identical Couture kids outfit and it saved me something like $400…LOL! Great post! Thank you for this post! I’ve been very interested in seeing what the different prices would be compared to making my own! Thanks for taking the time!